Influenced by the personal and the political, place is fundamental to Renee Couture’s studio work and research. Drawing inspiration from the historical and social landscape of place, she uses her own rural community as a starting point for her work in examining the tension between the literal and conceptual values imbued upon the surrounding landscape. Her project-based and research-responsive practice moves fluidly between media. She employs everyday objects and imagery to make her work approachable and enable viewers to engage with the ideas being presented and connect them to their own lives. Couture graduated from Buena Vista University (Storm Lake, IA) with a BA in Studio Art and Spanish. She spent the next four years rambling throughout the United States and South America working a wide range of jobs from camp counselor to wild land fire fighter to gourmet goat cheese maker, international backpacker to bank employee. She moved to Oregon in 2004 after completing Peace Corps service in Bolivia, South America. She earned her MFA in Visual Art from Vermont College of Fine Arts in Montpelier, VT. Couture currently teaches art at Umpqua Community College. Couture’s work has been exhibited nationally in group exhibitions and as a solo artist. She has exhibited as a solo artist at Lane Community College (Eugene, OR), Chemeketa Community College (Salem, OR), Eastern Oregon University (LaGrande, OR), Minot State University (Minot, NE), The Brink Gallery (Missoula, MT), and The Wood Gallery (Montpelier, VT). Group exhibitions include: Disjecta (Portland, OR), Tiger Strikes Asteriod Gallery (Philadelphia, PA), Whatcom Museum (Bellingham, WA), Work Gallery (Detroit, MI), and WomanMade Gallery (Chicago, IL), to name a few. 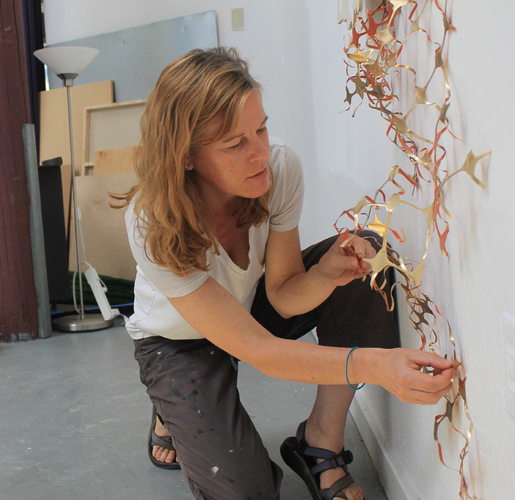 She is the recipient of an Individual Artist Fellowship and two Career Opportunity Grants from the Oregon Arts Commission, and two Project Grants from the Douglas County Cultural Coalition. Couture was a featured artist on OPB’s Oregon Art Beat, and has been granted residencies at Djerassi Residency Artist Program (Woodside, CA), Jentel (Banner, WY), Playa (Summer Lake, OR), Kimmel Harding Nelson Center for the Arts (Nebraska City, NE), and Vermont Studio Center (Johnson, VT). Currently, Couture lives on seven acres in rural southern Oregon with her husband, two dogs and two cats. She works out of a retrofitted 20-foot camper turned studio space located in her garden.